Whatever native language you speak and read, when it comes to the Bible and its translation, all native languages worldwide cannot translate the full meaning of each of the Biblical Hebrew words we find in the original texts. One Biblical Hebrew word ‘davar’ is translated in the KJV Bible by FIFTY different English words and phrases. Bible readers don’t know this and certainly don’t know why this happens. Do you? Let’s start at the beginning. You might have little or no knowledge of the Bible, that’s fine. You might consider the Bible to be a bunch of fables of no particular interest other than tales to tell kids, frankly, that’s fine too. You might even believe that the Bible is full of lies and actually is a ‘negative book’, well, you’re entitled to your viewpoint. If you’re wondering how and why we’re even talking about the Bible, why The Explanation went from Inventory and Audit of the Universe–all about our planet, humankind and how we humans work then please quickly look here: Why Theology?, Sacred Books and The Bible. You’ll better understand why this page talks about Biblical Hebrew. All of that said, one point remains. The Bible is the best-seller of all times and one way or the other, it is a ‘piece of literature’. If not for any other reason, but general knowledge, it behooves you to have even a cursory knowledge of its contents. So let’s take a closer look. I guarantee you it is going to be very revealing. The vast majority read the Bible in their own native language, That’s normal. Because the Bible has such a widespread audience it has been translated into 636 languages. The New Testament into 1442 languages and portions of the Bible into yet another 1145 languages, making it the most translated book of all times with new translations still appearing. In a nutshell, Bible translations (which have taken a lot of effort and scholarship) are very helpful but they are incomplete for one very good reason. The original words, mainly in Hebrew and Greek, have more meaning than what can be rendered in any one translated word or phrase. How can I affirm this? Simply because if you take any translation you’ll see that a SINGLE original word–let’s say in Hebrew–has been translated with MULTIPLE words in the translation, no matter what the language. 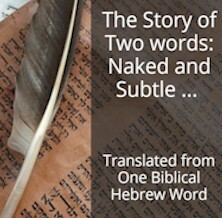 If it were so simple, every single Hebrew word would only have ONE and the SAME translated word. But each word has more than one–some have fifty different translations. Yes, you read that correctly–50 different renderings for the same Hebrew word as we’ll shortly see. You need to ask the fundamental question: How can ONE Hebrew word have FIFTY different translations? Done by expert linguists and Bible scholars who are doing their utmost to stay faithful to the original text. Biblical Hebrew is the original language of the Bible. You need to understand why a single Biblical Hebrew word can be rendered CORRECTLY with up to 50 words in your native language. The vast majority of the original language words have multiple translations. With that understanding in mind, I think you can easily and quickly realize that when you read ONE word, or ONE short phrase in your native language you are getting understanding but–your understanding is INcomplete. Don’t misunderstand what I’m saying here. Your native language translation in 99.99% of cases is correct. You can understand what the a/Author of those words is saying even if sometimes it is difficult. What I’m saying is that understanding of the Bible in any of the 636 or thousands of translations is only PARTIAL understanding. And partial understanding can lead to erroneous comprehension of the text. Just like partial understand of any and all subjects be they, science, humanities, geography or mathematics, can lead to error. Especially when we think we are making conclusions based on complete comprehension–because that’s what we believe or have been given to believe. Following is just a short answer to the above fundamental question regarding multiple native language translations for one Biblical Hebrew word. It really is a preview of the online course with the same title where you’ll discover a number of unspoken characteristics of Biblical Hebrew. If you want to understand the Bible, you need to be aware of these principles. You may not be aware of some to the examples I evoke here–all the more reason to join the course (online very soon) and increase your general knowledge. A friend of mine told me recently that he was playing a quiz game with some friends and a Bible related question came up and he answered it to the surprise of everyone there! He told me he knew the answer because of a conversation we’d had. You never know when this information is going to come in handy. Not that that’s your main motivation. I’ll even go so far as to say that most people with some knowledge and interest in the Bible are not aware of these seven keys and certainly not of this study method to unlock Bible meaning. Biblical Hebrew words have Various Meanings. act, advice, affair, answer, because of, book, business, care, case, cause, certain rate, commandment, counsel, decree, deed, due, duty, effect, errand, evil favored, hurt, language, manner, matter, message, thing, oracle, portion, promise, provision, purpose, question, rate, reason, report, request, sake, saying, sentence, some (uncleanness), somewhat to say, speech, talk, task, thing (concerning), thought, tidings, what(-soever), which, word, work. Why can one ‘simple’ word have so many different translations? What is the implication of this? This means that sometimes, when you read the KJV and come across one of these 50 words, in actual fact, it is the same word as ‘commandment’ as in the Ten Commandments. This is only one example of how ‘translation’ affects comprehension. Think about this: practically EVERY SINGLE word in Biblical Hebrew has MULTIPLE translation in your native language. This Biblical Hebrew course will explain why this is so.